The Illusion of Prosperity Ends? Playing It Safe Can Hurt You Apparently! Theft of metals — copper and aluminum as an example — have been growing in recent years as gutters are stolen off homes and catalytic converters are stolen from parked cars. My girlfriend just got an email from her college's security. There's been a rise in the number of catalytic converters stolen from pickups, SUVs, and passenger cars within the college's parking lots. Apparently it is rather easy to steal a catalytic converter from a vehicle as the thief can often bypass the alarm system. It only takes a minute or two with the proper tools. Catalytic converters contain platinum, palladium, and rhodium. Not much, but enough to make a used catalytic converter worth $100 or so. You don't even want to know what it costs to have one replaced though. Let's just say it isn't cheap. You'll know you've lost yours when you start your vehicle. why they need used catalytic converter ? The value of used cats has increased to the point where people are actually stealing them. A guy I know drives a Jeep Wrangler. He came out of a shopping center one day and the thing was loud as hell when he cranked it up. A check under it revealed that someone had hacked off the converter. This is also confirmed by the email my girlfriend just received. If you own a Toyota pickup or SUV, be careful where you park. It was mentioned by name. “Once again, take a whiff of the stagflation sandwich that is the September Chicago PMI. The headline index fell to 46.1 from 50 in the prior month, indicating that the Chicago manufacturing sector is once again in contraction after its brief breath of fresh air in August. Meanwhile, the prices paid indicator rose to 51.3 from 50. “Let’s see… economic stagnation + inflation thanks to the Fed’s money printing… hmmm… what’s that called? Gold has exploded. It's four times more expensive than it was just a decade ago. If stagflation does appear in a major way, here are a few alternative suggestions. Scan down to "Table 2. Producer price indexes and percent changes for selected commodity groupings by stage of processing" and check out the finished goods section. On average, they are down 4.3% since this time last year. There are a few exceptions to the rule though. I'm a toilet paper hoarder. Dishwashing detergent and laundry detergent are also things I have stocked up on. I'm very thankful I stocked up on dishwashing detergent by the way. Costco apparently no longer sells the 20 pound tubs of powder any longer. It no doubt has something to do with Washington State's recent ban on phosphates (by 2010). It isn't so much what he's planning to hoard, but his priorities. Note that toilet paper was mentioned first. Just a year's supply though? He's taking Noah too literally. Once it starts raining this time it may never stop. Sigh. Talk about a tongue twister! Just try saying that 10 times fast. That's not all that's twisted though. The math is too, and spun! Recent media reports of a 103% price rise in toilet tissue are incorrect and are based on a misreading of Australian Bureau of Statistics (ABS) data by Family First researchers in Senator Steve Fielding’s office. Kimberly Clark's correction is also based on a misreading of the data. You'd think they'd be extra careful knowing that there had already been one statistical mistake, but alas, that was apparently not the case. In 2004, the ABS quoted on a 4 roll pack of toilet tissue, but in 2006 it used an 8 roll pack in its statistics. Kimberly Clark didn't feel the need to point out that the 4 roll pack had 220 sheets per roll, but the 8 roll pack only had 190 sheets per roll. Surely they should have noticed. I did and I'm not even a toilet paper expert (although some might disagree, lol). The data clearly shows it. No digging deep required. In reality, that is true. But in practice, the rolls are not the same size so it is actually a completely useless statistic. In fact, it is every bit as useless as the original claim by the media. In December of 2004, "Toilet paper (4 x 220 sheet rolls)" cost an average of 305.375 cents in 2004. (I simply averaged the prices in the 8 cities provided.) That's 0.347 cents per sheet. In December of 2006, "Toilet paper (8 x 190 sheet rolls)" cost an average of 649.25 cents in 2006. That's 0.427 cents per sheet. That's a 23% increase per sheet in just 2 years. That's an average increase of 10.9% per year. Kimberly Clark was rightfully concerned about the first statistical mistake. The number of rolls was not held constant. The outlandish inflation claim by the media made Kimberly Clark look worse than they really were. Kimberly Clark had no problem whatsoever abusing that VERY SAME type of statistical mistake. The number of sheets was not held constant either. By not acknowledging it, Kimberly Clark made Kimberly Clark look better than they really were. There's a word for this behavior. It's called hypocrisy. Fortunately, governments do account for the quantity of an item when determining consumer price inflation. Unfortunately, the same cannot be said of the mass media and/or Kimberly Clark it seems. Two wrongs clearly don't always make a right. As scary as this sounds (and believe me it is scary), I trust government more than I trust the mass media and/or global corporations. That's not really saying much though. Sigh. And lastly, sorry Australia. Apparently you should have stocked up on toilet paper in 2004 when you had the chance. Humans have apparently become a disease that needs to be eradicated. No, really. Beware, Japanese humans. Big time. That's just creepy. On April 22, 2008 I posted What You Would Expect to See in a Developing Country. In that post, I referred to the following paragraphs from America, the Next Great Banana Republic written by Richard Backus in January of 2008. Let's see how the predictions are going so far. Sept. 16 (Bloomberg) -- The U.S. current-account deficit narrowed in the second quarter to $98.8 billion, the least since 2001, reflecting a smaller shortfall in trade of goods as imports and exports both decreased. This is good news. We only have $100 billion per quarter to go before things are in balance. We're half way there! Woohoo! I'm confident that a mixture of all three ways to shrink the current account deficit will ultimately work in the end. We're making so much progress. The annual current account deficit used to be $800 billion a year. We use the first way by placing tariffs on incoming Chinese tires. Check! We use the second way by making our currency as toxic as possible. Check! We use the third way to drive our unemployment up past 10%. Check! We're using all three ways now! So what could possibly go wrong? “We expect to see more stable demand going forward so we could see a mild widening of the current account next year,” said David Semmens, an economist at Standard Chartered Bank in New York. Oh oh. Can't have that. Where is Greenspan's Age of Turbulence when we need it? Fortunately, I'd wager that it is just a matter of time. Today, governments and central banks are celebrating their victorious stabilizing of the global financial system. To achieve the same, they could have saved Lehman with US$ 50 billion. Instead, they have spent trillions of dollars -- probably more than US$ 10 trillion when we get the final tally -- to reach the same objective. Meanwhile, a broader goal to reform the financial system has seen absolutely no progress. Trading gains are a form of income redistribution. In the best scenario, smart traders buy assets ahead of others because they see a stronger economy ahead. Such redistribution comes from giving a bigger share of the future growth to those who are willing to take risk ahead of others. Past experience, however, demonstrates that most trading profits involve redistributions from many to a few in zero-sum bubbles. The trick is to get the credulous masses to join the bubble game at high prices. When the bubble bursts, even though asset prices may be the same as they were at the beginning, most people lose money to the few. What's occurring now is another bubble that is again redistributing income from the masses to the few. The big change that happened is a rapid increase in the U.S. household savings rate. It happened much more quickly than I expected and has the potential to change the global economy. The economic explanation is negative wealth effect. U.S. household net wealth declined 20 percent, or nearly 100 percent of GDP. The rule of the thumb is that it would lead to a 5 percent reduction in spending. The U.S. household savings rate has increased more than that -- and continues to rise. It could rise above 10 percent next year. Because of rising savings, the U.S. trade deficit has already halved from the peak. It could halve again next year. This is why I have turned positive on the dollar. I can't argue with that. I'm in a semi-deflationary mood these days. A dollar turning positive would coexist quite nicely with my current theory that Dr. Copper Is Certifiably Insane. Financial markets are still maximum bearish on the dollar. Liquidity is being channeled out of dollar into all other assets. This is why there is such a high correlation between the dollar and other assets. I think this is the most crowded trade in the world. When the dollar reverses, the short squeeze could cause a global crisis. Many investors today think a bubble is inevitable and, when it bursts, another can be created quickly to keep on going with life as usual. What has occurred over the past six months seems to validate this viewpoint. History, however, is not kind to this view. Serial bubble making leads to a bigger economic crisis later. What occurred in the United States in the 1930s and Japan over the past two decades are good examples in that regard. If a new bubble were always available for bailouts, we'd have the ultimate free lunch. But there is no free lunch. I can't argue with that. The housing/debt bubble was MUCH bigger than the dotcom bubble and as such was MUCH more painful when it burst. The environment for tolerating such a loose monetary environment ends when inflation surges in emerging economies first and developed economies second. I can't argue with that. I have no idea how high the stock market can climb with me on the sidelines. I have no idea when inflation will become a problem again. I can say that oil and copper have outperformed the stock market since the bottom and I'm no more a believer in commodity driven stock markets now than I was in 2004. I can say this with 100% conviction. That's good news for investors all right. First, there are the bond market investors. Last month, investors put twice as much money into intermediate-term and junk-bond funds as into short-term bond portfolios. As a result, they have exposed themselves to much greater risk from rising rates or falling credit quality. When interest rates go up, as in 1994, investors in longer-term bonds can get slaughtered. "People feel they have to choose between the frying pan of zero yields and the fire of risk," said Crane Data's president, Peter G. Crane. "And they're sick of the frying pan, so they're jumping into the fire." Second, there are the stock market investors. "If the dollar continues to decline, (the Fed) would have to raise interest rates to combat rising inflation expectations. That would be bad for the markets first and later the economy," he says. Third, we must not forget about the housing market investors. How will rising interest rates affect housing prices? That low interest rates have been the driving force behind real estate's unprecedented rise is not a point of debate among economists. Quite simply, lower rates mean buyers can afford higher home prices. It stands to reason, then, that the opposite would be true. Yet, many economists have been arguing that higher rates won't hurt housing. It's kooky wacky crazy talk. Gotta love it! Unfortunately, it is very difficult to predict what the future holds for inflation. We cannot properly estimate global commodity demand and it is almost impossible to forecast an oil price spike that would be similar to last year's bubble. It is very difficult to predict what the future holds for inflation and yet we're told not to worry about it? I am now beating my forehead against my desk. Why did I continue to read the article? I must be a glutton for punishment. Using fundamental economic modeling, the odds of high inflation over the near term are extremely unlikely. Is this the same fundamental economic modeling that Bernanke was looking at when he said there was no housing bubble to go bust? The odds of my house burning down are extremely unlikely in the near term too. I still have fire insurance though. Ever try buying insurance once the fire trucks are parked outside? The most widely used theoretical model for examining inflation has been the Phillip's Curve. In most undergraduate macroeconomics courses, the Phillip's Curve is depicted as the relationship between unemployment and inflation. An increase in unemployment causes inflation to decline. Now you know why economics is considered the dismal science. Theories are often more important than facts. 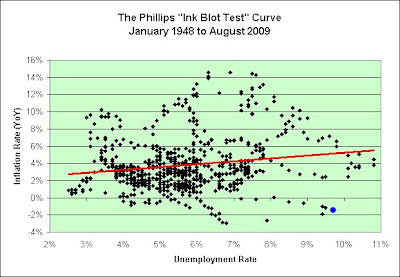 Here's the chart of the Phillips Curve from 1948 to present. I made it myself today. The blue dot represents where we are now. What pattern do you see in the data? I see a cumulus cloud formation. Maybe I can be an economist too? The trend line isn't exactly backing the Phillips Curve theory either, is it? If anything, it suggests that higher unemployment and higher inflation in that very noisy data set go hand in hand. I guess there must be more to it than that. What could possibly cause high unemployment and high inflation at the same time though? It makes no sense. It would mean that undergraduate macroeconomics courses are teaching the wrong things. Hey, maybe we can ask Zimbabwe. They successfully managed to get 94% unemployment AND hyperinflation. They ought to be able to give us some advice. If money is not demanded, goods are not purchased, and inflation cannot increase. It can't? I guess that completely rules out any sort of currency crisis. You know, our "money is not demanded" by foreigners any longer. Thank goodness that can't happen. We wouldn't want to suddenly find ourselves trying to buy goods from them with something they no longer want. As a side topic, I wonder how much oil would cost if we could no longer purchase it? The market does not expect inflation to become a problem. Would this be the very same market that was completely and utterly blindsided by deflation recently (as seen in his very chart)? Or is this the market that the dotcom bubble and housing bubble sneaked up on? Or is this the other market that has pushed gold up to $1000 an ounce? You know what? Maybe I'll pass on what the market(s) thinks when it comes to long-term inflation expectations. By the way, as a non-economist I am VERY skeptical of using TIPS to determine inflation expectations of the market. Those convinced that deflation is coming can and do buy Treasuries. Those convinced that inflation is coming aren't going to be buying TIPS though. They are going to be buying oil and other natural resources instead. I am actually in the middle ground. I worry about both deflation and inflation. Therefore, I do like TIPS. If I am right to be skeptical about using TIPS to determine inflation expectations, then inflation should actually run hotter than the markets think. In other words, there will be less demand for TIPS than there should be. If I was an economist, I'd argue that less demand for something I buy is a good thing. It means I bought it cheaper. I may lean towards deflationary thinking in the short-term, but I'm not at all done worrying about inflation long-term. Call me paranoid. I will conclude with one thing I do agree with the author on. It is very difficult to predict what the future holds for inflation. TLT is a long-term United States Treasury Bond fund and as such is extremely sensitive to changes in interest rates. Entrepreneurs are usually optimists inclined to believe things will work out, which is why they're willing to try something as laborious as starting their own business. But the recession has put them in a foul mood. A startling 94 percent said the recession will last at least another year. Only 3 percent believe the pain will end within six months. And 66 percent believe the United States is facing a long period of high unemployment. That's my opinion, for what it is worth. It is clearly not shared by everyone. As a metal heavily dependent on prevailing sentiment and consensus economic outlook in the best of times, it shouldn’t be surprising that copper was hit abnormally hard in the worst of times. By the time the dust from the panic settled in late December 2008, copper had plummeted 68.6% to $1.28 per pound! Such an epic decline in copper was unheard of. It was only unheard of for those people who didn't listen to charts dating back to the Great Depression. According to the USGS, copper fell 68.3% from an average price of $405 per metric ton in 1929 to an average price of $128 per metric ton in 1932. Keep in mind these are just averages. 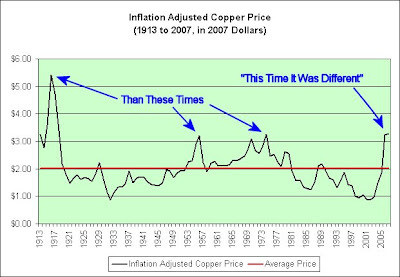 Copper no doubt fell much more than that from the highest price in 1929 to the lowest price in 1932. And Chinese GDP is actually growing despite the panic! In the year ending Q2 2009 that obviously straddled the stock panic, Chinese GDP actually grew by an amazing 7.1%! Chinese copper imports this year have risen to records in some months. Given the state of the world economy, copper demand (and hence prices) is likely to be far closer to pre-panic levels than the panic lows going forward. As I've said before, I do not believe in the China story (at least in the short-term and mid-term). I've warned of the China story many times in the past on this blog (even before it crashed). Every instinct I have (mostly originating from my gut) tells me that China must be hurting at least as bad as we are right now. Their biggest customer (us) came to a screeching halt. Copper was not falling because there was any fundamental reason for it to, but simply because traders were scared. Yeah, right. No fundamental reason for copper to fall. If you believe that I have some excellent oceanfront property in Kansas I'd like to sell you. An average single-family home uses 439 pounds of copper. There's more than 50 pounds of copper in a typical U.S.-built automobile: about 40 pounds for electrical and about 10 pounds for nonelectrical components. If you just bought a new home and a new car, then you've also just bought about 500 pounds of copper. Better keep up the pace! I'm told copper is going back to pre-panic levels! Look at that first chart in the first link. There's something on it I would like to point out. "Still Low Relative to Trend"
Which trend might that be? The "Pre-Panic Up Trend" of course. We'll be back on that global unsustainable trend before you know it. Kansas I'm telling you. Ocean front property! This information is intended to help you in your search for a Oceanfront Houses USA homes, land, and condos for sale in Kansas. We feature areas in all 50 States, Canada, and the Caribbean. I just bought a new Kill A Watt EZ unit at Costco. It was roughly $27 plus tax, which was more than the last one I owned (which I loaned to a friend). Here's my review of the device. The Kill A Watt lets you easily determine how much each of our electricity consuming toys costs us to operate. It is especially handy for things that don't always use the same amount of power and is somewhat useful for even the things which do. For example, a freezer uses more electricity in a hot garage than a cold garage. Further, it turns itself on and off a lot in order to maintain a constant temperature. Ever wonder how much that 60 watt lamp is costing you when you don't even know how often you keep it on? Over time, the Kill A Watt can tell you. You plug the thing you want to measure into the Kill A Watt. You then plug the Kill A Watt into the wall. You can then come back later and it will tell you a variety of things (total watts used, total elapsed time, and so on). This new Kill A Watt EZ offers a few more features than my last one but it is $10 more expensive. Personally, I think it is worth the extra money. Although my time is worth less to me than it once was, it is still worth something. Over the life of the unit, I expect it to save me a lot of time. First, if you unplug it from the wall it still remembers the data. The old one didn't. Second, it allows you to enter your actual electricity rate. It remembers that rate until you want to change it. This allows you to easily see (at the touch of a button), how much the electricity is costing per year, per month, per week, per day, or per hour. Very handy! No more dragging a calculator around. I recently said that I was curious how much my Playstation 3 would cost me to help out science through folding@home. The jury's in. It will cost me roughly $115 per year in electricity to have my Playstation running 24 hours a day to be part of the distributed computing network. That assumes I'd be running my Playstation solely to do that. I won't be. I play games on it too of course. I have also determined that my personal computer isn't nearly as cost effective. It draws roughly the same power, but can't do the work nearly as quickly. It's old and lacks the Playstation's faster math abilities. However, if I only allow it to do the work when my computer is turned on anyway, then the additional cost is only $34 per year (according to the Kill A Watt). That assumes my computer is on 24 hours a day, which it is not. In a nutshell, when computers have to think harder then they also use more power. Folding@home makes my computer have to think very hard. There's more to it though. Most of this extra power consumption goes directly into heat. In the winter, the true cost of helping science is far lower. I have to heat my house anyway. Both the computer and the Playstation become electric heaters. We keep our pet bird in my office. I normally put an electric heater in that room anyway during the winter to keep the bird warm. Therefore, running my computer to do science work for the benefit of mankind doesn't really cost me anything in the winter. I needed to generate the heat anyway. If cost is an issue, then don't contribute to science in the summer. Contribute more to science in the winter. It would be a win win for everyone. In any event, my Playstation 3 will be contributing year round. It would be a shame to waste its extremely fast computational abilities, especially since it draws less power than two 60 watt light bulbs. Starting in 2006, we began looking forward to another major advance in capabilities. This advance utilizes the new Cell processor in Sony's PLAYSTATION 3 (PS3) to achieve performance previously only possible on supercomputers. With this new technology (as well as new advances with GPUs), we will likely be able to attain performance on the 20 GigaFLOP scale per computer. With about 50,000 such machines, we would be able to achieve performance on the PetaFLOP scale. With software from Sony, the PlayStation 3 will contribute to the Folding@home project, pushing FAH another major step forward. With these computational advances, coupled with new simulation methodologies to harness these advances, we will be able to address questions previously considered impossible to tackle computationally, and make even greater impacts on our knowledge of folding and folding related diseases such as Alzheimer's Disease, Huntington's Disease, and certain forms of cancer. SIPC serves two primary roles in the event that a broker-dealer fails. First, SIPC acts to organize the distribution of customer cash and securities to investors. Second, to the extent a customer's cash and/or securities are unavailable, SIPC provides insurance coverage up to $500,000 of the customer's net equity balance, including up to $100,000 in cash. Sounds pretty good, right? Well, being the natural skeptic that I am most of my nest egg bypasses broker-dealers entirely. I mostly participate directly in government TIPS auctions and I also have I-Bonds that are either in my possession or are included in my Treasury Direct account. And why might that be? It is important to understand that SIPC is not the securities world equivalent of FDIC–the Federal Deposit Insurance Corporation. Congress specifically considered creating a Federal Broker-Dealer Insurance Corporation, but lawmakers wisely concluded that such a designation would be both misleading and out of step in the risk-based investment marketplace that is so different from the world of banking. Let's put this another way. The lawmakers "wisely" concluded that the risk-based investment marketplace is/was actually riskier than the world of banking. I know. It's kind of hard to believe these days. It actually is true though. Now you know why I was one of those people who pre-panicked when ETrade started experiencing difficulties. I moved my money to Ameritrade. It's still there. "That peers have virtually entirely avoided the credit crisis, again highlights the flawed strategy and lack of credible risk management by E-Trade's senior executives and the board of directors," Bhatia wrote in a client note. When asked what they would do with $500 of found money, a third of consumers said they would apply it to monthly bills. As a subset, however, more young professionals than affluent respondents said they would use the loot to go shopping for non-essential items (16% versus 6%). Asked about purchases over $500, young professionals once again showed the most willingness to spend. Only 15% of the general population said they plan to make a large purchase in the next 30 days. By contrast, 38% of young professionals not only said they would, but planned to spend more on those purchases ($2,460) than their affluent counterparts ($2,170). Sept. 25 (Bloomberg) -- Confidence among U.S. consumers rose this month to the highest level since January 2008 as the pace of job losses slowed and the economy started to pull out of the worst recession since the Great Depression. I can't speak for the economy, but I know real prosperity when I see it. It's in the video! Every day brings more examples of the failed strategy of fostering economic growth through the use of easy credit. Modern economies need credit to grow and prosper. Applying credit growth on an exponential basis ultimately fails when borrowers become so leveraged that any hope of repaying their debts becomes impossible. The Illusion of Prosperity is NOT over until I say it is over. Muhahaha! "These are the kind of numbers you deal with only on a cosmic scale," said Sylvain Cappell, New York University's Silver Professor at the Courant Institute for Mathematical Sciences. "If he thinks Bank of America has branches on every planet in the cosmos, then it might start to make some sense." Let's just hope he doesn't win the case. BofA is too big to fail. Hahaha! My short-term inflation mood recently popped up to positive and I'm now resetting it back to inflation/deflation neutral (as seen in the upper left hand corner of my blog). I gave oil a chance to create some inflation. It appears to be a false alarm. Oil looks toppy. Copper looks toppy. Gold looks toppy. Wages look toppy. Debt looks toppy. Stocks look toppy. China looks toppy. About the only thing I see these days that doesn't look toppy is the dollar. There may very well be too many dollar bears right now. Right now, everyone is dollar bearish. And I mean everyone. Conversely, the number of bets on gold and a declining dollar are at their highest levels since before July 2008 when global markets collapsed. When everyone is on the same side of the fence, you know the trend won’t last. That's what my gut is telling me. So far this year, more than $17 billion has poured into funds that invest in TIPS, government-issued bonds whose principal grows with rising inflation, according to estimates from research firm Morningstar Inc. That compares with estimated net cash inflows of almost $10 billion for 2008. $17 billion once seemed like such a big number. That all changed when we started running trillion-dollar deficits though. These days, $17 billion is what gets lost in the couch when you invite your Federal Reserve buddies over for a game of Rockband. If the Fed pushes rates up faster than inflation rises or raises rates before inflation picks up, TIPS could rack up losses for their owners. That's a risk that I'm willing to take. Apparently there is pent up demand for something that I already own. Of course, given the anemic economy and high joblessness, any resurgence in inflation may be distant. As I've said before, inflation cannot help my inflation adjusted after tax return. Therefore, I would not complain if any resurgence in inflation may be distant. "You're not buying these for tax efficiency, you're buying because you're scared of inflation." Scared might not be quite the right word for it these days. Let's just say that I respect inflation. If the two of us were in a caged ring, I'd be doing whatever I could to stay away from it. I'm not really heckling the article by the way. I had a slight concern over what constitutes "pouring", but other than that I thought it was a pretty good article. The appearance of synthetic gems on the market created major concerns in the diamond trading business, as a result of which special spectroscopic devices and techniques have been developed to distinguish synthetic and natural diamonds. By the way, one of the worst techniques in the history of mankind is to simply ask if the diamond is synthetic or natural. This is especially true during a wedding ceremony. If you can't tell by looking at it, then keep your mouth shut. Trust me on this one. Hahaha! I guess I can now rule out ever landing a job at De Beers. Oops. The diamond kings of the world are facing a crisis caused by the almost complete lack of demand for their wares. It is the third rise this year and prices are now rising faster than at any time since the 1980s. 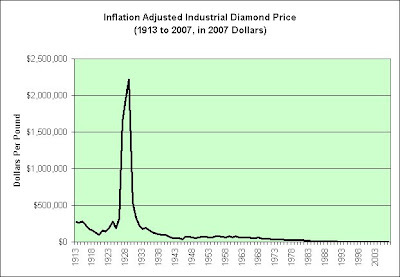 Like housing in the US, diamonds spawned a bubble in which easy-to-obtain credit made buyers willing to pay higher prices and created a false sense that these polished rocks were perpetually rising stores of value, said Christopher Ellis, president of Consensus Advisory Services LLC, a Boston investment bank that advises companies on restructuring. There is an ongoing debate on whether or not gold is a want or a need. I see it as a want. Others see it as a need. I can say that precious stones failed the test. Perhaps precious metals won't. Only time will tell. As more people are losing their jobs, some Inland pawnbrokers are attracting a new Mercedes- and BMW-driving clientele that, like everyone else, is seeking quick cash to make ends meet. "I'm seeing more gold, diamond rings, watches -- higher ticket items," said George Boullon, owner of Wimpey's Jewelry and Loan in Murrieta. "You see people pulling up in $80,000 Mercedes. And they're in Hummers." Another bright spot for the shops -- the gold market is hot. When they can't sell gold jewelry, they can always melt it down for scrap gold, pawnbrokers said. During a hot market, properties “sell themselves” so there is less need for strained descriptions. This theory suggests that we should anticipate the incidence of effusive language to fall during a boom and rise during a slump. Let's temporarily put all that aside for now. To me, it might just come down to the following two videos. “We can no longer afford to subsidize animal care and control,” Triplett said in a statement. He said it’s not a “core business” of King County to operate the shelter and animal control service for 32 cities in King County. He said talks have begun with the 32 cities and community animal welfare agencies to replace the county’s role in animal control. I guess we already spent all the money subsidizing banks. Please excuse my language. Since I am not a religious person, it probably wouldn't hurt to get a second opinion. There can be little doubt that the availability of a ready source of home equity has reduced the costs and uncertainties associated with income volatility, retirement, unexpected medical bills and a host of other life events that can unexpectedly draw down savings. Overall, the household sector seems to be in good shape, and much of the apparent increase in the household sector's debt ratios over the past decade reflects factors that do not suggest increasing household financial stress. A consequence of our highly competitive, rapidly growing economy is that the average American will hold many different jobs in a lifetime. Rather than endlessly heckle the economy and what not I thought I'd also do something else to contribute to society, lol. I therefore now have my Playstation 3 and my personal computer doing more than just providing me with entertainment. As of today, my personal computer is also doing some work. In fact, it is doing work as I type this and I don't notice any performance degradation at all. The reason I don't notice is that folding@home only uses the spare capacity of my computer to do the work. Okay, now I'm watching this video while continuing to contribute to society. How cool is that? Why wasn't I doing this sooner? Oh well. At least I'm doing it now. It feels pretty good. It would not surprise me if it added a week onto my life just knowing that I am actually doing something to potentially improve someone's life. That brings me to a new label for this post... real prosperity. This really is no illusion. For those interested in furthering the cause, I would invite you to learn more about folding@home in the link above. I also would like to invite you to join team "IllusionOfProsperity". Right now there's just my PC and my Playstation 3 working on solving some of the diseases of mankind (although MANY other computers and gaming systems are also working). Should you feel so inclined to join me, my team number is 172023. The software comes pre-installed on the Playstation 3. It's good to go. The software for the PC was easy to download and simple to install. There are quite a few versions of it since it runs on virtually every computer out there. Even this old Windows 2000 based machine is supported. That said, you still need at least a decent machine by today's standards. A Pentium 3 probably isn't going to be fast enough. I'm still a folding@home newbie, but I'd be more than happy to help with the process in any way that I can. It's not an entirely free lunch of course. Nothing ever is. My computer is using a relatively minor amount of extra electricity right now but the Playstation 3 in the other room is using more than it would normally be using (since it would otherwise be turned off). In the coming days I will provide an estimate on how much it costs per hour to contribute using current electric rates and monitored electricity usage, at least as it applies to my two systems. In theory, I expect my Playstation 3 to be less than 4 cents per hour to operate. I won't know until I test it though. Perhaps we can make the Illusion of Prosperity an actual reality. Perhaps we can leave the children and grandchildren of the future more than just a large pile of debt. Wouldn't that be nice? ... if you want to be popular. Sept. 24 (Bloomberg) -- This isn’t the time to be critical of China’s 2009 economic boom. That’s clear enough from the hate mail that clogs the inbox of anyone who dares suggest China won’t grow 8 percent forever. Even Sarah Palin, a former Republican vice-presidential candidate, seemed to pull her punches while addressing a conference in Hong Kong yesterday. Neither strong feelings nor politeness toward your host changes the fact China is setting the stage for something we may look back on as a lost decade of sorts. Oh well! By the way, this isn't the first time I've agreed with William Pesek. Au contraire! Check out these classics from the distant past. William Pesek and Andy Xie have yet to steer me wrong. Oh my. I just had an au contraire thought. I'm a stagflationist but I can't actually buy gold at these prices. "AU" is actually the symbol for gold. Contraire means contrary (contrarian). Coincidence? Read the book! My last post shows a chart of gold. Gold is difficult to get a handle on because its price was fixed for so many decades. That price was then allowed to roam free. This distorted the long-term trends. Copper does not have that problem though. Like gold, copper has been a fairly good long-term inflation hedge. The key, as with any inflation hedge, is to buy it at the right price though. There was a massive unsustainable global construction brought on by amazingly cheap credit in recent years. Buildings and houses use a LOT of copper. That was probably not the best time to buy copper and tuck it away for future use. Of course, we don't know that for sure yet. It's still $2.81 per pound and only slightly below its 2007 price average. NEW YORK, Sept 23 (Reuters) - U.S. copper ended down 2 percent on Wednesday as worries about eroding Chinese demand for the metal made investors look beyond the dollar, whose weakness had helped the market rally most of this month. They say that gold keeps up with inflation long-term (but no more than that). So, here's my attempt to see where we are. I'd say a picture is worth at least a thousand words. In 2004, I bought gold pretty much right on that red line. I expected to hold it forever as a long-term inflation hedge. Just two years later I sold for more than a 50% profit (even after transaction fees to buy the gold and resell it to the Mint). As long as gold stays well above that red line, I'm not even remotely interested in buying it back. At the risk of sounding like a broken record I will once again offer my standard opinion. 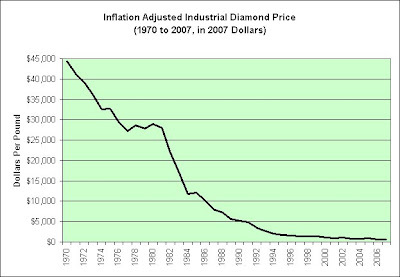 In order for gold to justify its current price, we better start seeing some serious inflation pretty soon. Even then, I honestly believe that there are far better things to hoard right now. For example, toilet paper has yet to explode in price (as gold has) and would surely rise in price substantially if inflation becomes a serious problem. If you believe serious inflation is coming then take a long tour of Costco, Sam's Club, and Wal-Mart. Back up the truck. There are plenty of items you will someday need that haven't even remotely exploded in price yet. Further, if inflation does not come then you won't be required to sell your hoard at a loss to a lesser fool. You can simply consume it in the future. I have hoarded a great many items at reasonable prices. While possible that hindsight will show I was a fool to do so, it is very unlikely history will show that I was the greater fool. For example, hindsight is not being all that kind to my sneaker hoard. I have accumulated eight extra pairs since 2004. They cost me $14.99 a pair at Costco when I first started. They still cost $14.99 at Costco. It's amazing just how much the rest of the world wants to make us cheap goods. I think mab (a commenter on my blog) really hit the nail on the head recently. This isn't a battle between deflation and inflation. It's a battle between deflation and anti-deflation. Based on my sneaker example above, I truly think that puts it in the right perspective. Others take issue with the methodology used by the Bureau of Labor Statistics to calculate the CPI—for example, its decision to register a decline in price for newer computers that cost the same as an old version but offer more capabilities. That’s one reason independent economist John Williams, who runs Shadowstats.com, argues the CPI underestimates inflation’s true impact on Americans by as much as three to seven percentage points. Perhaps the independent economist John Williams would like to take me up on a little offer. Since he is arguing that there hasn't been deflation in computer prices, I'd be more than happy to sell him my old TRS Model III computer (assuming I can still find it, since I loaned it out many years ago) for the same price my girlfriend just paid for her new laptop. I paid slightly more than she did, so he should be getting a bargain. Here's what he can expect from that "laptop" of the past. Here's the similar laptop of the present. Her new laptop is at least 1,000 times faster, has nearly 90,000 times more internal memory, has infinitely more hard drive space, includes a DVD player, has a vastly superior monitor, can actually receive wireless communication, can be used away from an electrical outlet, comes bundled with Microsoft Office, AND comfortably sits on a lap. Other than that, these two machines are clearly pretty much identical though. I wonder when I can expect a check for $799 (plus shipping and handling)? If my offer isn't enticing enough and/or I can't scrounge up a Model III, then I might be willing to upgrade him to a superior TRS 80 Model 100 (or something even nicer, who knows!). It was actually designed to be a laptop. It would be $799 well spent! And just two years ago, I bought a genuine TRS 80 Model 100 through eBay. It cost me US$50 (the original retail price was A$1299). It was, and is, in perfect nick, still in the box and working like a charm. It's tempting to consider gold overbought. It currently trades at $1,017 an ounce, an all-time high. It's survived two asset bubbles with flying colors. It sells for three times its April 2001 decade low of $255 an ounce. First, when people tell me that something is not a bubble and state it as fact, then I tend to get a bit nervous. Second, since when is 3.988 times ($1,017 / $255) rounded down to "three times"? Call me crazy, but I might be tempted to actually round up. Before you continue to call me completely crazy though, consider what this VERY same author wrote just over three years ago. That sound you hear is the real estate bubble popping. Or so thinks Wall Street. When new home sales slipped 10.5% in February, it gave fresh evidence of the long-expected end to the housing boom. Homebuilder stocks are down as a result. Maybe that's unjustified: The big builders will tell you that an industrywide falloff in home starts lets these well-capitalized companies steal market share from the small-time developers, who are still numerous. Yes, that's right. He was heckling the popping of the housing bubble and told us we could make money in real estate. How did that work out? 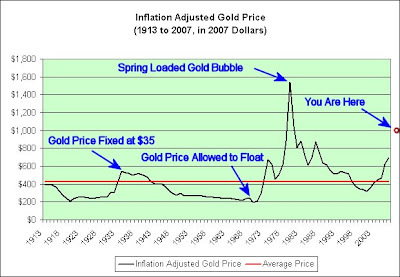 In my opinion, in order to justify gold's current price then inflation better show up at some point. Further, if inflation does show up there are probably better things to hoard than something that has already risen by a factor of four. Toilet paper continues to come to mind. Just a thought. I know this isn't going to be popular with the gold bugs, but I just call it like I see it. I'm not saying gold is in a bubble, but I certainly have no interest in buying it (again) at these prices. There is serious risk at these levels and that is not something I look for in a "safe" store of value. Maybe that's just me. Of course, we'll know one way or another in the coming years. It will be interesting to see what happens. TIPS. You may be familiar with Treasury Inflation Protected Securities (TIPS), and they’re a very good long term inflation hedge. Based on the article's headline, I am VERY impressed that he's getting off to such a great start. I expected to be heckling and/or using sarcasm by now. Have patience though. I assure you that it is coming. Hahaha! But the problem with TIPS today is they don’t produce much income for you to live on. Okay. The logic is starting to degrade now. TIPS are a capital preservation strategy. Nobody should expect TIPS to actually make them richer. I know this is a wacky theory, but I actually intend to use all of my savings to fuel my retirement. I expect to die relatively broke. I've just never been a very big fan of having my cake and eating it too. That said, the "problem" he mentions surely doesn't apply to other investments. Investors have made a killing in the stock market over the last decade. Treasury Bills are yielding an amazing 0.1% right now. Sign me up. I'm still kicking myself for not buying houses in 2005 so that I could generate income through renting them out. Yeah, right! So if you load up on TIPS and we don’t get high inflation, or it takes years for inflation to emerge, you may be forced to spend more of your principal to pay the bills. There you have it. Complete economic logic degradation. The word asinine comes to mind. There is ABSOLUTELY no circumstance when inflation can actually help those of us who buy TIPS and hold until maturity. The higher inflation goes, the more we'll pay in taxes and the lower our after tax return becomes. It's that simple. Although holders of TIPS have some inflation protection, we should NEVER pray for higher inflation. Period. Further, higher inflation makes it even worse than that. With TIPS, we get taxed on the inflation adjustments each and every year but we do not even get paid the inflation adjustments until the bonds mature. In other words, the higher the inflation, the worse our short-term cash flow situation becomes. Should inflation go high enough, all interest payments would be used solely to pay the taxes. Further, the taxes could at some point even exceed the money we are paid. We could therefore actually go cash flow negative. Not only would we not have the income to live, but we'd have to find other income just to pay the taxes on the TIPS. So let's sum this up. Higher inflation does two things to holders of TIPS. The higher the inflation rate becomes, the more taxes we'll have to pay on the inflationary gains. This will reduce our inflation adjusted after tax return. Ouch! The higher the inflation rate becomes, the worse our cash flow situation becomes. We'll be spending more of the interest we do receive simply to pay the taxes. Ouch! I would be thanking my lucky stars! Greenspan said in 1966 that there is no safe store of value in a welfare state. Clearly there is no safe store of value in a main stream media state either. As proof, he started with the premise that TIPS are a "very good long term inflation hedge" and then proceeded to use incorrect logic to say why we shouldn't own them. What does he want us to own instead? Flexibility. As long as you keep your fixed income holdings flexible, you should be able to respond to inflation by eventually buying bonds that provide higher income, while still earning more income today. Never mind that fixed income investing ruined investors in the 1970s. Those who take him up on it will indeed get higher income now. Spend all of it. Don't worry about inflation. Your nest egg's purchasing power will last a full 10 decades. Take that trip to Europe you always wanted. Enjoy! Speaking of "10 decades", do yourself a huge favor. Watch the first scene from the Newlywed Game (both her answer and his answer). In my opinion, our economy is packed with dumb luck. We can't help but win long-term. AFTER SECOND-QUARTER MUTUAL-FUND PERFORMANCE turned positive -- the first good showing since the economic crisis started -- financial planner Nancy Anderson expected a flood of inquiries about buying stocks. None came. "I was surprised," says Anderson, who works for Financial Finesse, which advises 401(k) clients like Aetna and General Motors. "I'm a certified financial planner. But calls about foreclosures and hardship withdrawals were up," as well as questions about budgeting and debt payment. So much for animal spirits. She was surprised? I'm reminded of my last job. The General Manager was telling me that he just gave a "Coming to Jesus" speech to one team. He needed everyone on board. Anyone who didn't feel up to the task should tell him now and he'd put them on another team. Guess what? Nearly everyone wanted off of the team. Surprise! It seems that people grew tired of the heavy overtime and being continually told they were not doing a good job. The creation of such an ambitious engine came at a price, however, and the game which was originally due for release in Summer 1998 didn't ship until Fall 1999 after changes in the design team and the decision to undertake a major rearchitecture of the engine halfway through production. In its original form, the game was buggy, to the point where it could not be completed. Fixed in patches, it was still an annoyance that you would have to start all over again. This surprised me immensely. I asked him how that could possibly be. Brace yourself. A federal "cash for appliances" program is likely on its way to a store near you before the end of the year. Here's what's on my appliance list. 1. A 19 year old electric stove top (two burners don't work). 2. A 19 year old electric oven (built in microwave oven above it doesn't work). 3. A 19 year old gas furnace. 4. A 12 year old washing machine (works fine). 5. A 12 year old dryer (doesn't work so fine, squeals). 6. A 4 1/2 year old portable air conditioner (died a few weeks ago). Financial procrastination pays off yet again. Power to the frugal (if it still mostly works, then don't pay to replace it yet), the lazy (can always fix it tomorrow), and the deflationists (things only get cheaper, so wait)! This is a great deal for those who already have money and/or a job. However, aren't we just borrowing money from the less fortunate so that we can give it to the more fortunate? This is very confusing. I mean really. People with NO money and/or NO job will have to help pay for this someday (our children, our grandchildren, and the massive number of unemployed come to mind). Why exactly are we doing this again? I guess I'm not the only one looking at my computer screen trying to make sense of it all. I do not think I'm at maximum confusion yet though. I think that begins when the government introduces its "Cash for Everything" Program. There are just so many things that I'd buy with "free" money. It's absolutely staggering. My quote comes not from the article (which certainly is very quotable), but rather from the comments. Here's what commenter John Ryskamp has to say. I trust no one is stupid enough to believe that the "stimulus" and "bailout" nonsense is evidence of government "engaging" with the society. It is simply corporatist looting--backing up the powerful in the society in any way they can be backed up. The society? It will continue to sink. It is sick--no government wants to be a part of that. As a holder of Treasury Inflation Protected Securities (TIPS), I have a vested interest in tracking the Consumer Price Index (CPI) and understanding how it can affect me. The CPI is something I understand and for the most part I am comfortable with how it is calculated (as it relates to my investments anyway). The GDP Deflator is something I did not understand so last night I attempted to better educate myself. The CPI uses a fixed basked of goods from some base year, meaning that the quantities of goods and services consumed remains the same from year to year in the eyes of the CPI, whereas the price of goods and services changes. The GDP deflator, on the other hand, uses a flexible basket of goods that depends on the quantities of goods and services produced within a given year, while the prices of the goods are fixed. Generally speaking, the two indexes track each other fairly closely. The article offers an example showing how an extraordinary event can cause the two indexes to vary widely though. I'm going to offer my own example so that I can plug in actual numbers. Let's say the basket of goods consists of exactly two items to make things simple. The first product is a six-pack of Coca Cola. The second product is a six-pack of Pepsi. Let's say each product costs $2 and therefore our basket of goods costs $4. Now we'll add an extraordinary event. The Great Depression sets in. Pepsi goes out of business. Meanwhile, Coca Cola has to cut prices in order to get people to drink soda over water. In one year it costs $1 for the six-pack of Coca Cola but it costs $99 for a six-pack of Pepsi (if you can even find one). Under the CPI model, your basket of goods would now cost $100. That's a 25 times increase in the price of your goods. That's hyperinflation! Under the GDP deflator model, your basket of goods would now only cost $2. You would have substituted entirely to Coca Cola. Rather than have one six-pack of each, you'd now have two six-packs of Coca Cola. That's serious deflation! What once cost you $4 now only costs you $2. So what is the truth? It depends. If Coca Cola is your life and the thought of drinking Pepsi upsets you anyway, then your standard of living will rise substantially. If Pepsi is your life and the thought of drinking Coca Cola upsets you, then you will most certainly experience a massive price increase and/or a dramatically lower standard of living. As far as our Gross Domestic Product is concerned, it's deflation. Everyone would assume to have substituted to Coca Cola. Pepsi went out of business. Hello deflationary spiral. Hello Great Depression. As far as the CPI is concerned, we've entered hyperinflation. Clearly we haven't really entered hyperinflation though. Most rational consumers would substitute. So when you see people get all bent out of shape talking about the bogus CPI and how substitution is a conspiracy and a fraud, you may wish to think twice. We really do substitute. Without that substitution, the CPI really does overstate inflation. Further, very few substitution adjustments have been added to the CPI. I substitute a LOT more than it thinks I do. I substitute all the time. If something becomes more expensive, I'm very likely to buy less of it. If something becomes less expensive, I'm very likely to buy more of it. To summarize, consumer substitution is a sign of inflation. BLS has been convinced by politicians to use consumer substitution as justification for removing inflation from inflation. Huh? So the CPI is a way to measure inflation (rising prices) without equal mathematical weighting for items that are rising rapidly in price. That is utter BS. While we do substitute away from items rising in price (so that part is right), we also substitute towards items falling in price (which he has conveniently ignored). Substitution therefore isn't a sign of inflation or deflation. When substitution appears, it simply means that all prices are not rising or falling uniformly. The lack of substitution adjustments will always make inflation appear to be higher than it really is. Hopefully you can see that in my example. Without substitution adjustments, all it takes is the price of one product in the CPI to move to infinity and the entire index would move to infinity right along with it. For some products where no substitution is possible, that's a rational outcome. However, if the price of Pepsi (but not Coca Cola) became infinitely expensive tomorrow, my budget would not be infinitely doomed.